it hangs out in the rain forest of Borneo. Most of what is known about this elusive creature is from anecdotal tales told by local villagers. It is said to take down tiny muntjac deer by jumping down on them from the trees and opening up the throat to kill them. Then the squirrels are free to open the deer's abdomen so that it may feast on the blood and nosh on the organs. Yeah, ew. Sightings of the squirrel is virtually unheard of. So when scientists managed to catch it on video for just a few seconds they considered it a triumph. 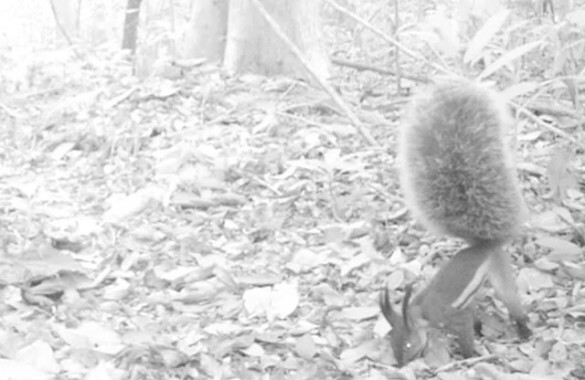 It shows the rodent foraging through the leaves on the ground like any other squirrel species. The team that caught the footage hopes to gather more video so that they can learn about its ecology. Perhaps then they might find out if the rumors of hunting and killing are really true, though they believe it is highly unlikely. The squirrels are known to eat the nuts from the canarium tree. This is hardly your average little tree squirrel dashing about your yard. 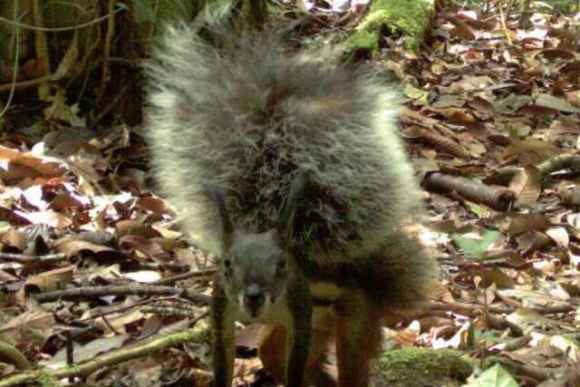 It is twice the size of most tree squirrels and has the fluffiest tail in relation to its body size of any mammal. It will be interesting to see what science will learn about them in the future. It’s A Bear-Eat-Bear World In Canada!